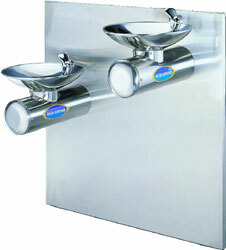 : 2 round basins wall mounted type drinking fountain. The standard bubblers are top-press bubblers. But you can choose to change to front-press bubblers (The push buttons of the bubblers are on the front.). CJ-316 can be connected with CJ-318 (cooling system) to offer cold water.